The day after Thanksgiving – known as “Black Friday” – is one of the biggest shopping days of the year, when intrepid shoppers brave long lines and sometimes unruly crowds for legendary bargains. A couple of theories profess how the day came to be called “Black Friday.” One theory credits it to the time of year when retailers typically stop operating at a loss and get “back in the black.” Another says Black Friday got its black eye because of traffic jams and other mayhem caused by frenzied shoppers. Have a battle plan. Don’t let rock-bottom prices land you in a financial hole. Without a plan, you might be enticed to buy things you don’t need. Make a list of what you need and then compare stores ahead of time. Throughout Thanksgiving week, check ads to see where and when to find the best prices. (Remember, some large retailers are open on Thanksgiving Day to jump-start sales). Be on guard for a ”bait & switch.” Read the fine print on store ads promoting Black Friday shopping. Watch for wording such as “while supplies last” and “10 per store” in reference to computers, flat-screen televisions and other big-ticket items. Stores will lure shoppers with drastic reductions on such merchandise but limit the number of deals to the first few customers. It may not be worth going out of your way to seek out these sales. Watch out for “Special Buys.” Some stores have been known to offer less expensive versions of popular items for massive Black Friday shopping sales. For example, inferior parts may have been used in the manufacturing of electronics and other goods you’ll find on sale. If you see signs such as “special buy” or “limited edition,” you may want to consider walking away. Prepare for the long haul. If you’re planning to stand in line for hours for door-buster deals, dress for the weather, keep hydrated, and cultivate patience. Munch on snacks so you don’t get hungry and irritable. If pushing and shoving starts, keep your temper and stay out of the fray as best you can. Even the hottest deal on the planet is not worth an injury to yourself or others. Report any violent activity to store security or other authorities. And, keep a fully charged cell phone with you at all times. Find a shopping buddy. 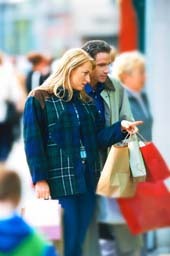 Waiting in line or battling heavy traffic can be a drag, but shopping with a friend can make Black Friday shopping fun. When you discover that your much-desired tech gizmos are sold out, you’ll also be able to benefit from your friend’s moral support. In addition, your buddy can also act as your designated shopper, to keep you from swiping your credit card until it melts. Await Cyber Monday. The Monday after Thanksgiving is when online retailers cut prices for holiday shoppers. If you don’t round up everything you want on Black Friday, just wait out the weekend and then shop by computer on Cyber Monday. We’ll bet you won’t even miss the Black Friday free-for-all! Black Friday Veteran Shoppers: What are your tips for less spending and big savings? Share them with us in the “Comments” section below.